This is one of those things I’ve had for a lonnnngggg time and never quite got around to reviewing. 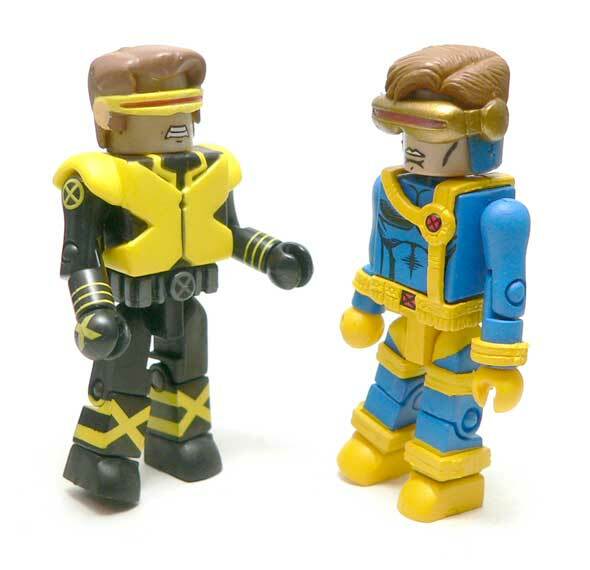 In the first of 2 parts, I’m taking a look at two of the figures from the Marvel Minimates X-Men DVD 4 pack. 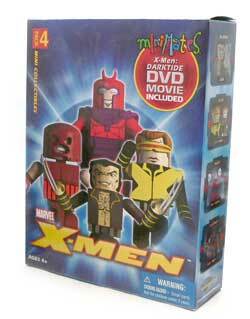 This one came from Toys R Us along with a DVD of X-Men: Darktide. Let me start by saying the characters are in their more modern gear than 90’s versions that most of my previous Minimate reviews have been based on. I know he’s one of the X-Men, but this costume might be taking the X thing a little too far. It starts with the large yellow X that makes up the jacket/vest thingee. It’s a decent piece if you can get past the loud yellow color. The little extended shoulder padding is cut away to give Scott a bit more arm motion range. Past that big X, are a number of smaller ones. The shoulders, hands and shins are all painted with them in yellow. Another X is sculpted into his belt buckle. Those paint apps are all nice enough for being yellow on black. There’s a little slop, but it’s minimal. The shoulder patches are probably the best of the bunch. 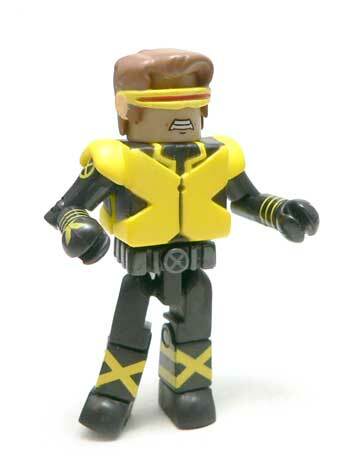 Where the 90’s Cyclops I’d previously reviewed had some texture to his hair, this version has a smoother hair piece. It also has a smaller more modern visor. 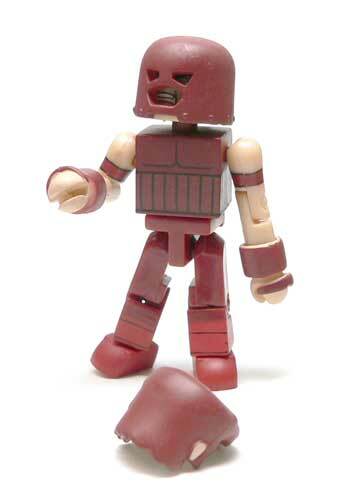 Underneath the hair piece, this older Minimate doesn’t have a peg to keep his hair on. Cyc’s head doesn’t have a hole for the non-existent peg, so you can’t just swap for the other version. The face underneath the hair is the angry Scott Summer’s we’ve seen over the years in the comics. I was glad to see they didn’t try to go with some sort of cloud around the eyes to represent his optic energy. In general, this isn’t my favorite version of the X-Men’s leader. But, then again, I’m older than a number of modern comic book fans. At the time I got this set, I didn’t have any version of Mr. Summers. So he filled a spot until I got the 90’s version. Juggernaut is one of those villains that has the ability to cross over Marvel books. He’s always looked a bit more like Spiderman villain to me. This Minimate does a pretty decent job of representing the unstoppable man. The brown costume is wall done and the extra wrist pieces and hand straps go a long way to selling the look. The major contributor to the look is the head though. The heavy dome shape has rivets at the bottom and even a bit of chin showing. Pop off the iconic helmet and pop on the extra hair piece (The only accessory in the set) and you have a very psycho looking Cain Marko. The hair piece looks similar to some of his classic appearances. Where the head is a great representation of Juggy, the body is lacking one thing. Size. Comparing him to the heavy jacketed Cyclops he looks less like an unstoppable force, and more like a guy with a big head. A body piece would have went a long way to improving his overall appearance. In a way I’m glad I waited to review this set until after I’d got some of the more contemporary sets. If I’d based my opinion on this set alone, I probably wouldn’t have rated it very high and may have passed on any more of the Marvel Minimates. As it is, these two figures are not the best representations of their characters. 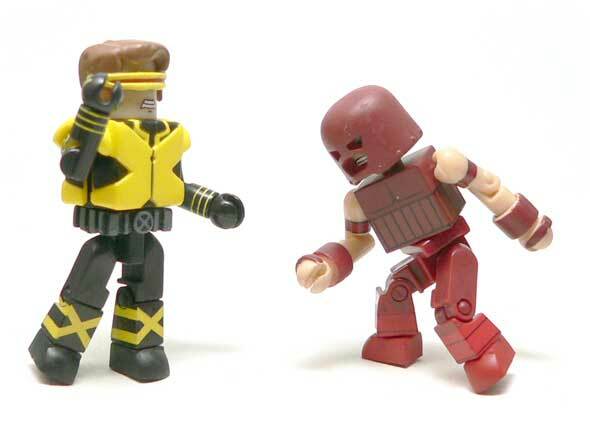 Cyclops isn’t in his most recognizable outfit, and Juggernaut just isn’t bulky enough. 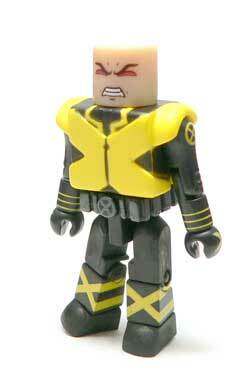 However, as part of a mass market release of popular X-men they aren’t bad as a starter set. 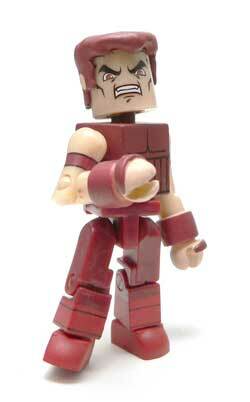 Why are you and Yo Go Re trying to get me addicted to Marvel Minimates as well?! I love these guys but am doing everything to resist their call.